Discussion in '3D Printers & Projects' started by TeeJayHoward, Sep 24, 2018. 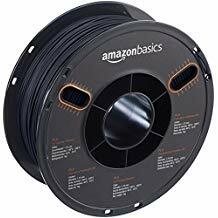 I'm curious about AmazonBasic's filament as I love their spool design. Being able to tell at-a-glance how many grams are left on the spool is something everyone should have implemented by now. 'Course, I know nothing about the quality of the plastic on said spool. Anyone used them before? If not them, what manufacturers do you like and why? I haven't used it before. I'd be interested to hear from someone who has, as well. I usually stick to cheap-o Microcenter Inland brand for basic stuff, Hatchbox for nice colors and exotics, and ProtoPasta for exotics. I hear matchbox makes good pla not sure about amazon. My first spool i purchased was cree and its not bad. The Amazon Basics filament is getting pretty good reviews in the Prusa Facebook groups. Haven't tried it myself yet. I've used several different colors of 3DSolutech from Amazon. For approximately $20 per 1KG spool, it prints very well. Prusa has announced their own branded filament which will eventually be available through Amazon. Sounds like good stuff and expected to be around $25 per 1KG. I've also had good luck with Atomic Filament.